Don't you wonder how they look? Akrosot is roughly 5'5" and ways around 100 pounds, his skin is a dark red, his eyes solid Deep purple. He has Deer-like antlers (6 horns on each antler) and 2 small tentacle protrusions on his chin, the left one is clearly damaged (half is missing). These are fairly uncommon in most Teiflings which would suggest his Devil ancestory is of a rare kind. His hair, that goes down to the middle of his back, is Black, unnaturally so, its almost the absence of hair. When on an adventure he always wears his armor (no helmet, hair tied in a knot too keep it close) and his harmonica is always on a string around his neck. His Violin case remains closed when in the field but always nearby. He has a thin Rapier on his hip, and a backpack. When he is off duty, he always wears fine Clothes, and after a succesful mission a new set of clothes are on top of his list of purchases. His preferred main colours are Royal Purple, maroon, Dark blue. Often with Light coloured Details mixed in to accent it. For nicer performances he'll polish his antlers, and his harmonica is no where to be found, instead he uses a immaculately carved Violin that is well preserved. Most nights he'll brush out his hair, and without really asking (anymore) he'll play a song on his violin over dinner. Afterwords, youäll often find him reading one book or another, mostly fairytales and other fantastical tales. Often moving his lips or doing small gestures as if re-enacting the action. Left or right handed when playing the violin? He plays the violin right handed. 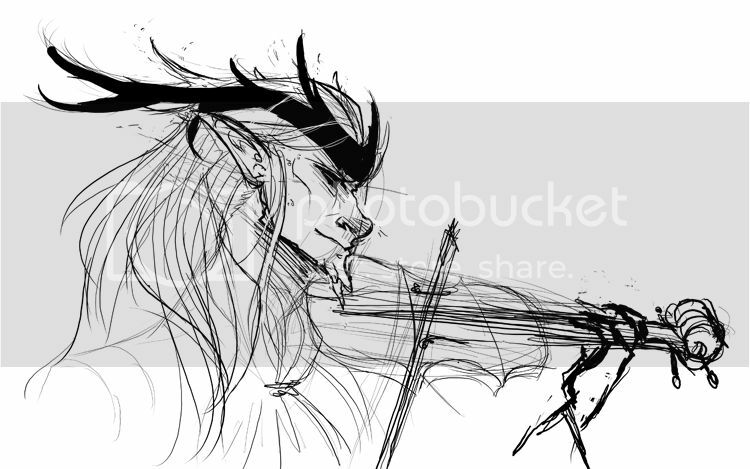 Mostly because this violin was made for right-handed use, but also because he realised it is treated with more respect among the nobles in Rhodania for some reason he was unable to quite fathom. So here's a rough draft for you. Let me know if there are any specific things you'd like added/changed. You mentioned an "immaculately carved violin". anything of the sort that you want added? Right now, the draft just has a basic violin. Feel free to provide reference images if there's anything you want specifically. Don't be afraid to ask me to change things =) at this stage, it's easily done. Last edited by LegionoftheFirst on Sun Mar 20, 2016 3:22 am, edited 1 time in total. It has a floral design, the "head" would be a slightly wilting rose, the side is a wreath of flowers, the front has two roses instead of the black "brackets". The back has an old castle, which nature gas started to reclaim.